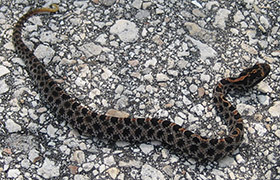 For photographs of the common species of snakes in Texas, click on the Common Snakes of Texas page. Coral Snakes: The coral snake has markings which have been cleverly copied over the years with many other non-venomous species of snake adapting the same brightly colored markings to try and ward off predators. Usually boasting bright red, yellow and black stripes, there are plenty of ways in which you can tell non-venomous apart from their venomous counterparts but you would be better advised to leave the snake to its own devices unless it’s bothering you. 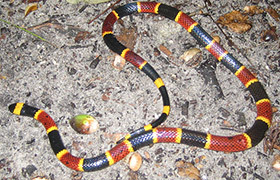 Coral snakes tend to live in soil or within rock burrows, particularly in scrub-covered sand hills, and usually prefer to be reclusive and nocturnal than a massive problem for humans. If a bite does occur, symptoms can take many hours to form, usually starting with slurred speech and vision problems, a result of respiratory failure and rapid paralysis. Medical intervention is required. There is a rhyme you can use to determine whether or not your brightly colored snake is a venomous one or not, using the way the stripes are arranged to tell them apart: “Red and yellow, can kill a fellow; Red and black, a friend of Jack” This essentially means when red and yellow are together in the pattern, the snake is venomous. If the red is next to a black stripe, the snake is not venomous. Cottonmouth (Water moccasin):One snake, two names, the cottonmouth snake is definitely one to avoid, growing to over four or five feet in length. The older it gets, the darker this snake’s coloration will be, graduating from lighter browns to darker blacks over the years. A very toxic venom is the reason you’ll want to avoid this large snake, one that causes its victims to hemorrhage and requires medical intervention. If you see a dark snake that looks relatively harmless but has a white lining on the inside of its mouth, you could be faced with a cottonmouth and should back away slowly. The snake will usually only attack when threatened. 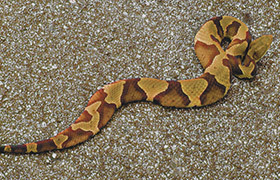 Copperhead: This is a rather rare snake so it isn’t likely you’ll bump into this venomous snake, but you might think you’ve spotted one. Just like many the coral snake, the copperhead has been copied by other non-dangerous species of snake such as the northern water snake. Another medium sized snake, the copperhead is a brown / rust / tan color with rough and irregular shaped patches of darker and lighter tones, easily camouflaging the snake into the leaves scattered across the forest floor. A snake that will only strike when threatened, the venom can cause secondary infections but isn’t usually overly dangerous to human health. As the name suggests, all of these snakes have a rattle in their tail to warn you that you’re getting too close. If you hear a rattle-noise, back away, it could be one of these species of snake, all of which are considered venomous. The Diamondback rattlesnake is the largest of them all with the capacity to grow to over eight feet in the right conditions. 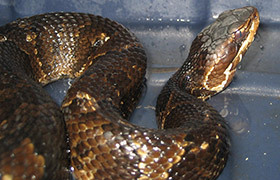 You’ll find this snake in areas of thick brush or vegetation, usually opting for dry areas rather than wetlands. The pygmy rattlesnake is one of the smallest venomous snakes of Texas, also known by a few other names such as small rattlesnake, spotted rattler, grey rattlesnake, ground rattler, and more. Another semi-dwelling snake, the pygmy rattlesnake likes to live along rivers and lakes as well as marshes, streams and ponds, but is also well adapted to live in highly wooded areas too. Nocturnal much like other snakes that fall under the ‘pit viper’ name, this rattlesnake likes to spring up on its prey, use its venom (not potent enough to seriously harm a human) to subdue it, the list including other small snakes, toads, frogs, squirrels, birds, rats and mice. The massasauga rattlesnake is another relatively small snake only growing to around thirty inches long, it lives in similar habitats to the pygmy rattlesnake - grasslands, marshes, streams and ponds and particularly prairies. The western rattlesnake is a little bigger, boasting a large and triangular shaped head with a slimline neck, growing to over double the size at 65 inches. The western variety also prefers drier habitats and eating rodents and small mammals to water-dwelling life. As the name suggests, the Mojave rattlesnake likes to live in the Mojave desert but are known to wander into other areas, particularly semi-grasslands and cactus shrub. Growing to around four feet in length, their triangular shaped head is matched with a green-grey coloration with paler diamond shaped bands, making it a snake often confused for the large diamond back rattlesnake. 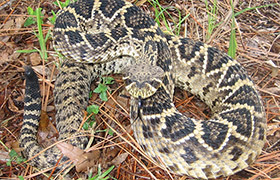 More of a medium-sized snake, the timber rattler or timber rattlesnake is a snake often found in rugged terrain and forests although during the summer it is not unknown for pregnant females to head to warmer and more open spaces such as rocky ledges. They are well known for their love of garter snakes, a common species of non-venomous snake found in Texas. You can learn about venom vs poison if you wish. For more information, go to my Snake Removal - How to Get Rid of Snakes home page, and learn more about how to get rid of the poisonous snakes of Texas.